1954 Federico Fellini released the classic Italian film La Strada (1954, It.) (aka The Road). It won the first official Academy Award for Best Foreign-Language Film, awarded during the Academy Ceremony honoring films of 1956. 1954 Paramount Studio's first VistaVision widescreen production was director Michael Curtiz' hit film White Christmas (1954), an Irving Berlin musical. 1953-1954 Although an all-electronic, color TV broadcasting system was introduced in the US in 1953 (when a second NTSC standard was adopted), NBC had the first national (coast-to-coast) color TV broadcast of the 1954 Tournament of Roses Parade on January 1, 1954. It was one of the rare examples of a color broadcast. Most network TV and local programs continued to be broadcast in black and white until the mid-1960s. 1954 The "auteur theory" was first rudimentarily expressed by 21 year-old critic/filmmaker Francois Truffaut in his essay in the French film-review periodical Cahiers du Cinema titled "A Certain Tendency in French Cinema." 1954 Graphic design genius Saul Bass began his legendary career (spanning over 40 years until his last film Casino (1995)) as title designer for Carmen Jones, and later gained his first major recognition for his work for The Man With the Golden Arm (1955). His revolutionary designs broke tradition by using jagged lines and bold colors to redefine title credits and poster images. He was best known for his work with Alfred Hitchcock, Otto Preminger, Stanley Kubrick - and later with Martin Scorsese. 1954 On the Waterfront (1954) nearly swept the Academy Awards with eight wins, including Best Picture, Best Actor (Marlon Brando), Best Supporting Actress (Eva Maria Saint), and Best Director (Elia Kazan). The acclaimed film was widely perceived as Kazan's response to critics of his testimony two years earlier before the House Un-American Activities Commission (HUAC). Kazan attempted to vindicate himself politically with this semi-autobiographical film - the justification of naming names ('squealing') to expose the evils of corrupt unions, and the suggestion of sympathy advocated for squealers or informers. 1954 Japan (and its Toho studios) gave birth to the long-running series of Godzilla monster films with Ishiro Honda's Gojira (1954, Jp. ), featuring Godzilla in his screen debut. The monster was a fire-breathing metaphor for the fear of the nuclear age. It was soon followed by the release of Godzilla, King of the Monsters (1956), the US remake of Honda's original 1954 film. The shortened and re-edited 1956 film included new footage with Raymond Burr (known more recognizably as Perry Mason, playing US reporter Steve Martin), to bring in more post-war audiences. 1954 Disney was the first major Hollywood studio to create TV programming. Walt Disney himself hosted various versions of his long-running prime-time, anthology TV series "Walt Disney" (e.g., "Disneyland," "Walt Disney Presents," "Walt Disney's Wonderful World of Color"), appearing first on ABC-TV in late October of 1954, and then moving to NBC-TV in late September of 1961 at the start of "Walt Disney's Wonderful World of Color." 1954 Dragnet from Warner Bros. was the first theatrical film based on a TV show of the same name (the then-popular B/W NBC-TV show ran from 1951-1959). Its star Jack Webb (as Sgt. Joe Friday) turned it into a feature (color) film, and served as the director. A movie of the TV show was remade as Dragnet 66 (1969), a TV movie - it was filmed in 1966 but not broadcast until 1969. 1954 In the case of Theatre Enterprises v. Paramount Distributing (1953), the U.S. Supreme Court decided in early 1954 to uphold the right of film distributors to confine the exclusive showing of first-run engagements to downtown theaters. Motion picture producers and distributors had been charged with violating the Sherman Anti-trust laws by conspiring to restrict "first-run" pictures to downtown Baltimore theaters, thus hurting business in suburban venues. The court ruled that there was no evidence of an illegal agreement or conspiracy among independent exhibitors in Baltimore, who accounted for 63% of "first-run" exhibitions. 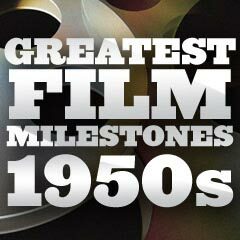 1954 The American Releasing Company was founded by James H. Nicholson and Hollywood lawyer Samuel Z. Arkoff -- the precursor of American International Pictures (AIP) in 1956, noted for its low-budget exploitation films and drive-in movies for the profitable teenage market. Their first film was writer/producer Roger Corman's The Fast and the Furious (1954) starring John Ireland and Dorothy Malone. The horror films of Bert Gordon, Roger Corman's series of adapted Edgar Allan Poe horror films with Vincent Price, biker and drug-related films in the 60s, the 'beach party' films of Annette Funicello and Frankie Avalon, the teenage monster film cycle (i.e., I Was a Teenage Werewolf (1957)), and the earliest films of Jack Nicholson, Robert De Niro, Francis Ford Coppola and Peter Bogdanovich (and many others) were AIP productions. Emphasis on these sensationalist sub-genres (beach party films, kung fu films, biker films, juvenile delinquency pictures, monster and horror films, women-in-prison films, etc.) would be imitated by countless other independent production companies and film-makers. 1954 British actor Sydney Greenstreet died at the age of 74, due to complications of diabetes related to his extreme weight. He was best-known for his debut film role - a portrayal of crime figure Kasper Gutman ("The Fat Man") in director John Huston's debut film, Warners' The Maltese Falcon (1941), opposite Humphrey Bogart and Peter Lorre. Over the span of their careers, Lorre and Greenstreet appeared in nine films together, including two Michael Curtiz war films: Casablanca (1942) and Passage to Marseille (1944). Both the atomic bomb ('Fat Man') and the Jabba the Hut character in Return of the Jedi (1983) were inspired by Greenstreet. 1954 The adult-themed Animal Farm (1954), an allegorical tale based on George Orwell's 1945 satirical political novel, was the first animated color feature film made in England. 1954 Director Herbert J. Biberman's and writer Michael Wilson's independently-made, political and social commentary historical drama Salt of the Earth (1954) was the only theatrical-length film ever openly made in the US by a group of blacklisted film-makers. Based upon the real-life zinc miners strike in New Mexico of Mexican workers in the early 1950s, it was opposed during its making by many groups, including technicians' unions working on the film, the government, business, labor unions, and the FBI, among others.